The pecan is a type of tree nut native to the Midwestern and Southern regions of North America. It is a good source of protein and healthy fats, and, according to researchers from the New Mexico State University published at at the Journal of the American Dietetic Association, eating two handfuls of pecans a day can lower rates of the bad cholesterol linked to heart disease. Pecans are popular in Southern cooking; the pecan's sweet meat makes it a common dessert ingredient, though they also are often used whole as toppings for salads or chopped as a crust for soft cheese, fish and meats. Pecans are oblong-shaped brown with a rough husk. Choosing: Look for whole pecans in the shell. Look for shells without signs of cracks or holes. When shaken, the nuts should not rattle. 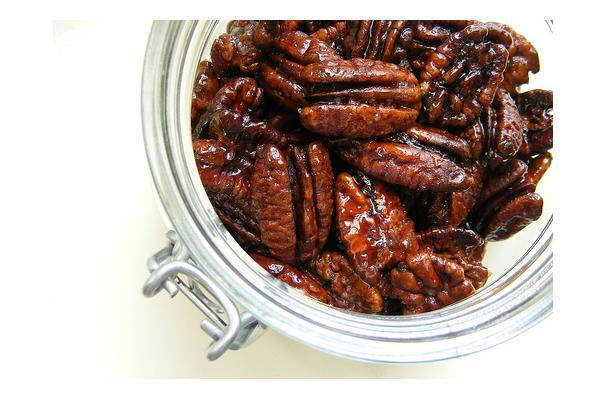 Buying: Pecans appear in the fall, but the nuts are also made into pecan butter or pressed to make pecan oil. Pecan shells are cracked to reveal the nut inside. Because of the high fat content of pecan nuts, they should be used immediately or else they can easily go rancid. History: Pecans have been the staple food of Native Americans long before the white American settlers. The name pecan was given by early North American Indians. Pecan means "to use a stone to crack it's shell"